This easy White Almond Sour Cream Cake (Doctored Cake Mix Recipe) is delicious, dense enough to hold up to fondant, versatile enough for cupcakes, and sturdy enough to handle light carving. Some bakers want to work exclusively with scratch recipes, while others prefer to only work with doctored cake mixes. I have recipes that I LOVE that fall into both categories. Whether it is a scratch cake recipe or doctored doesn’t matter so much to me as how the cake tastes! This White Almond Sour Cream Cake is a great example of a tried and true doctored cake mix recipe that would please any crowd. 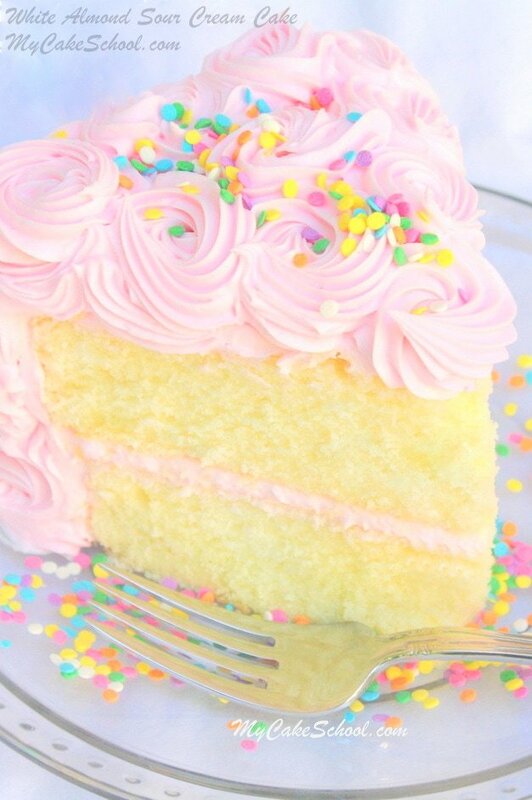 I love the flavor and texture of this cake. The sour cream in the recipe gives it a nice density without being too heavy. I like almond desserts and so for me, the hint of almond in this cake recipe is delicious. However, if you are not an fan of almond, no problem! Simply leave the almond flavoring out and you will have a fantastic White Sour Cream Cake recipe to serve your friends and family. If your cake calls for more extensive carving, or tapering as with a topsy turvy design, the much denser “Durable Doctored Cake Mix Recipe” in our Recipes section is probably the best bet. This White Almond Sour Cream cake is very versatile. You can substitute other cake mix flavors with great results. We also have a fabulous Chocolate (doctored cake mix) version of this cake which you can find here! : Chocolate Sour Cream Cake: Doctored Cake Mix Recipe. 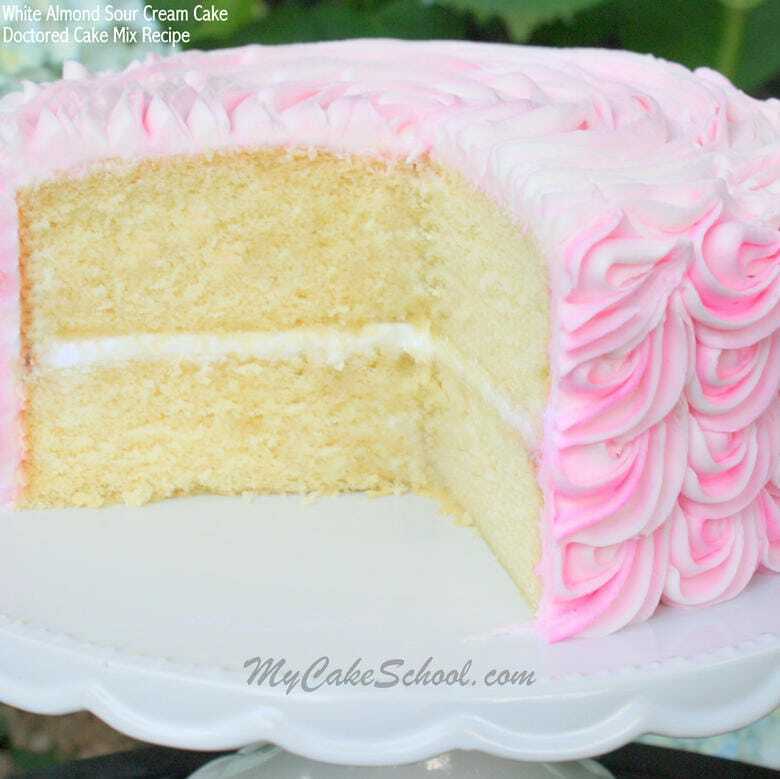 We discovered this popular White Almond Sour Cream Cake years ago on CakeCentral.com (where it is very well known and often abbreviated as WASC). We use this recipe often, but also get rave reviews for our scratch version of this cake which can be found here: Scratch White Almond Sour Cream Cake Recipe. Preheat the oven to 325 degrees. Grease and flour two 8x2 round cake pans. In the bowl of your mixer, combine dry ingredients and whisk at least 30 seconds to blend. In another bowl, combine sour cream, water, eggs, & flavorings. Add the wet ingredients to the dry and mix on medium speed for 2 minutes. Stop after 1 minute to scrape the sides and bottom of bowl then continue to beat for the second minute. Pour into prepared pans and bake at 325 degrees....check at 35 minutes to see if middle of cake springs back when touched, a toothpick inserted in the center of the cake come out clean or with just a few crumbs attached, and the cake will be slightly pulled away from the pan. We bake at 325 degrees to decrease the height of the dome on the cakes. Makes about 7 cups of batter. Works well for cupcakes. We also have an amazing White Almond Sour Cream Cake from scratch recipe! You can find it here & pin or print it for later: White Almond Sour Cream Cake from Scratch! Thanks for stopping by! We hope that you enjoy this White Almond Sour Cream Cake recipe! For a full collection of our FAVORITE frosting and cake recipes, make sure to stop by our Recipes section! Hi Linda, Yes, you can. Use 4 egg whites instead of 3 whole eggs. I made this cake yesterday for a mermaid themed baby shower and it was a hit! I followed the recipe exactly (besides adding food coloring to the cake) and also used the suggested Vanilla Buttercream recipe. It was so moist, not overly sweet and the almond taste was just perfect. I did use 9” round pans instead but had plenty of batter. Hi Lauren, Your cake is lovely!! Thanks so much for posting your nice review. Hi is there a reason why people suggest not to use Pillsbury vs another cake mix? What’s the difference? Hi Jessica, It is fine to use Pillsbury for most cake recipes. If a recipe has instant pudding as an ingredient, using Pillsbury cake mix might cause it to be too dense because the cake mix also has pudding in the mix. Duncan Hines and Betty Crocker do not. Otherwise, it is personal preference on which brand you use. When Pillsbury changed its formulation and decreased the amount of mix in a box, we thought it also changed the flavor. That is when we switched to Duncan Hines. Makes perfect sense. Thanks so much for the clarification! It’s been an hour but the cake top still is not brown. What should i do? The toothpick came out clean. Is there a picture of this cake as it came out of the oven? baked and dry. Possibly your oven is not heating correctly. It would be a good idea to buy an oven thermometer to make sure your oven is heating to the temperature you set for baking. As usual excellent recipe. Have a question…I have seen on cooking shows to tap the cake pan lightly with batter in it a couple of times before baking to release air bubbles. Do you think this is a good idea or does it take away from the fluffy texture of the cake? Thank you!! Hi Katherine, Yes, it is a good idea. 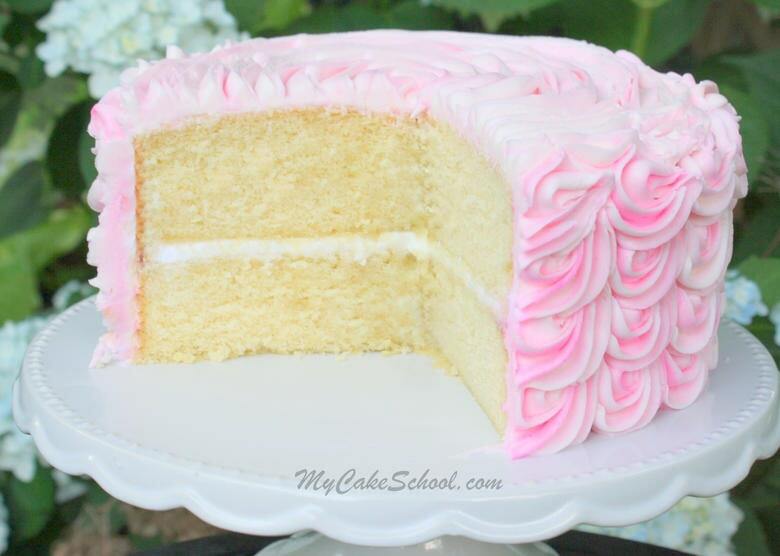 We tap the pan several times to release the air bubbles and it doesn’t affect the texture of the cake. Do you think I can use creme bouquet flavoring instead of the almond? Hi Sharon, Yes, it will be fine to use creme bouquet. Thank you for the quick reply! I have another question please: I’m going to bake the cake in 2 9″ pans tomorrow and freeze them for moistness. Bebe, if I want to fill and decorate it on Wednesday afternoon, should I defrost on Tuesday or wait until Wednesday and work with a cold cake? I’m very confused. P.S. This is a birthday cake for my two best friends and I want to get it perfect. BTW, I’m frosting it in buttercream. Thank you so much…I REALLY appreciate it! Hi Judy, Yes, you can. Hi can I use butter golden Duncan Hines box mix? Hi Taylor, I have never used the DH butter golden mix. I assume that it uses butter instead of oil. I did a quick search for comments on using golden butter vs the classic yellow and there were mixed reviews. I would think it would be fine to use for the WASC recipe. I would love to know your thought if you decide to use it. Hi, can you tell me how many cupcakes this batter makes. I am sorry if you have answered this question in the pass. I have made this cake many times to great reviews. Now I want to make a number 20, cupcake cake, Would I need to make a double batch of the batter? Hi Tanisha, The recipe should make 36 to 40 standard size cupcakes, depending on how full you fill the liners. It would be a good idea to place cupcake liners out forming the number 20. This will help you decide if you need to double the recipe. If you double, I think you will have extra cupcakes to freeze for later and that is always good. Thank you so much for getting back to me. I only need 25 cupcakes.